On August 9, 1999, I did the thing that every Today's Special fan has always dreamed of doing - I visited Simpsons, known on the show as simply "the store", in person! 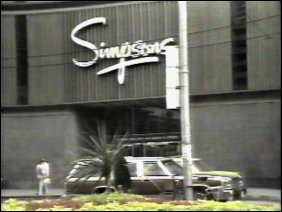 Having seen Today's Special for so long, it seemed like I'd been there many times, despite the fact that the most recent images of the store that I'd seen were from 1987, and that this was actually my first visit to the store. 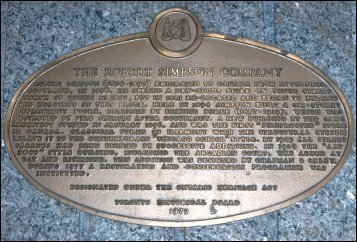 According to the real plaque, which is actually a historical marker on the building's exterior, the store was built in 1896 for the Robert Simpson Company, after a previous Robert Simpson Company structure on this site was destroyed by fire shortly after opening. When they did Today's Special, though they never said the store's name on camera, only mentioning the store in the end credits as "With special thanks to Simpsons Limited", they did stay true to the store where they did their on-location filming. 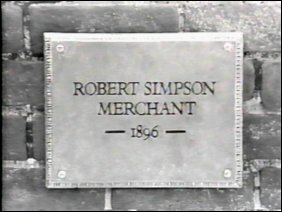 For instance, in Our Story Part 1 and 2, the plaque shown was historically accurate, reading "Robert Simpson, Merchant, 1896". The plaque used on the show was a simplified version of the full historical marker. 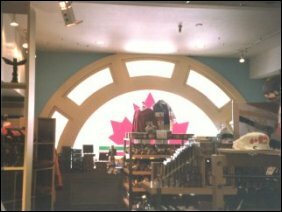 When I visited in 1999, the store had not changed a whole lot since the age of Today's Special, save for a name change from "Simpsons" to "The Bay" in 1991 - the last Simpsons location to change over to The Bay. But while the name may be different, it's still the same store underneath. In the two images below, the left is a video still from Our Story Part 2. The photo at right is of the same location in 1999. 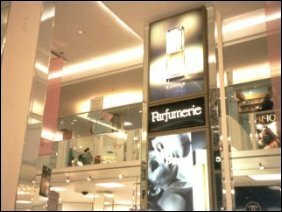 Except for the name on the front of the store, the two plaques on either side of the entrance, and the small writing above the entrance, it is very much the same store. You can tell by looking at the windows on either side of the signs, as well as the streetcar wires running over Queen Street. 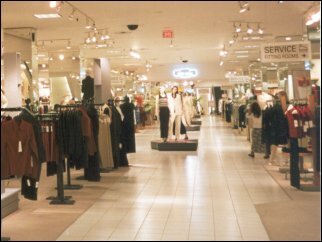 Inside, the store hasn't changed all too much, either, aside from various updates made as part of running a department store. It was very recognizably "the store". In the incident in "Hello Friend", after studying the buttons on the elevator, one must wonder whether the buttons that Jeff and Jodie pressed contributed to their becoming trapped in the elevator. When Jodie first entered the elevator, she pressed "Alarm". Then, in order to correct her initial button press, she pressed "Alarm" and "Stop". Jeff then entered, and pressed "Stop" and "Alarm" before resorting to percussive maintenance, striking the wall above the elevator buttons with a closed fist, stopping the alarm, and remarking, "At your service!" Then, of course, the elevator doors shut. Once closed, Jeff tried the open button, but to no avail, presumably because the elevator was already messed up. Other parts of the store also haven't changed a bit. 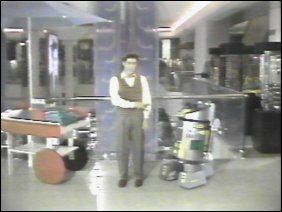 In 1984's Wheels, Jeff sings a song, beginning with, "In the night there's magic... have you ever dreamed of wandering through a store?" Even though we saw it in broad daylight instead of nighttime, it still is straight out of Today's Special. A look at video stills from Wheels compared to those taken in 1999 show that little has changed, aside from paint and such. Then if you turn right around after facing that window, you land in another area in the store with significance for Today's Special fans - the area where Jeff first met Roby-Bot on Moods. As you can see, the balcony has changed little since Today's Special ended. Elsewhere in the store, there are lots of things to do. The lower level even features a large food court! In the lower level food court, there were all kinds of places to eat. There was pizza, a deli, an ice cream place... you name it, they had it. They also had places to buy candy and things for bagging. It's really amazing. In addition to the food court on the lower level, The Bay is also home to the Arcadian Court , which itself has a long, colorful history, on the eighth and ninth floors. 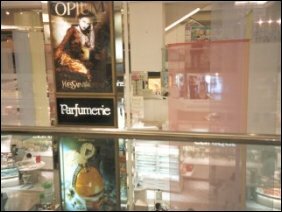 The Children's Department on the show was a set, not based on any part of the actual store. The children's department in the real store bears no resemblance to the one on the show. The real children's department is on the fifth floor. The fifth floor was divided into three sections, going back from the elevators: Fine china, children's apparel, and then toys. In the toy department, you had shelves upon shelves of all kinds of toys. They even had a room full of "Stuffies", ranging from average-sized to giant. Sarah Lanthier (as big of a Today's Special fan as myself) and I actually sang the "Hug A Stuffie" song that they sang on Stuffies in there. Despite that it didn't look like the Children's Department of Today's Special, the trip to the children's department was definitely neat. 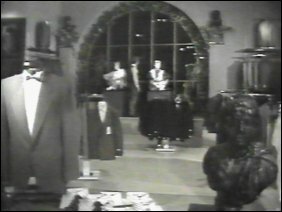 In 1986's Wishes, Jeff went to the men's formalwear department to stare out the window in the final scene after he had given up his wish to become a real person in order to return everyone to normal. This area exists on the second floor. The plaque, known on the show as the one item that saved the store from demolition in 1983's Our Story Part 1 and Our Story Part 2, is a simplified version of an historical marker that is located at the store's entrance at the corner of Yonge and Queen Streets. 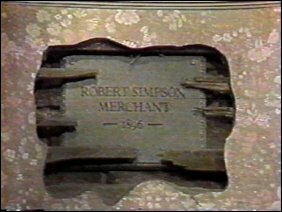 Robert Simpson (1834-1897) emigrated to Canada from Inverness, Scotland, in 1856. He opened a dry-goods store on Yonge Street south of Queen in 1872, but in 1881 re-located and began to extend his holdings in this block. Here in 1894 Simpson built a six-storey department store, designed by Edmund Burke (1857-1919), which was destroyed by fire shortly after occupancy. A new building by the same architect opened in January 1896, and was the first "fireproofed" store in Canada. Classical forms in harmony with the structural system relate to the contemporary "Chicago School" style. By 1923 all street facades had been unified by successive additions. In 1929 the "Art Deco" style building, including the Arcadian Court, was added at Bay and Richmond. This addition was designed by Chapman & Oxley. During 1977 a restoration and conservation programme was instituted. Overall, I had a good time at the store. The only things I wish I had found were the department where Jeff sang his "Hocus Pocus Alimagocus" song (Family, Television, Our Story Part 2), and the restroom where we saw Phil sneak a drink in 1986's Phil's Visit. But I found almost everything else in the store! It was so neat to see everything that I'd seen on Today's Special so many times. 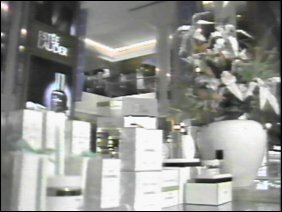 The entrance where they had a "Barbie at Bay" display was recognizable as the entrance where Muffy first entered the store. Back then, a "Cheeses of the World" display was in that window. Still, I can almost hear Sam saying, "Now go straight home now, don't be playing in the puddles! Ah, there's a nice little mouse. A mouse! Hey! Hey, stop mouse!" And as I mentioned before, even though I was going to the store for the first time, it seemed like I had been there so many times before. 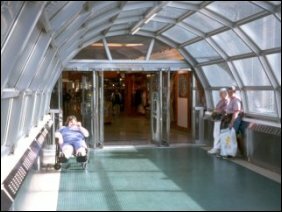 This is the other end of the skywalk as seen in 1984's Wheels. 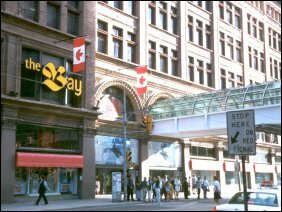 This end connects the store with the Toronto Eaton Centre across Queen Street. 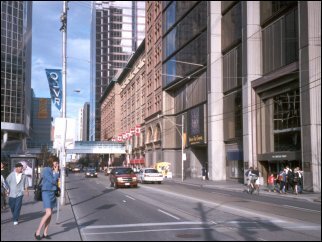 The Simpson Tower stands at the northwest corner of the store, at the corner of Queen and Bay Streets. 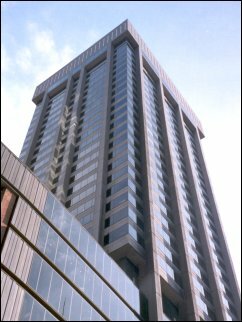 The Simpson Tower, according to information provided by Emporis, was completed in 1968. The tower is also accessible from inside the store. 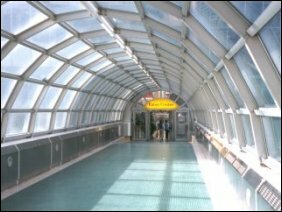 Interior of the skywalk between the store and the Toronto Eaton Centre. 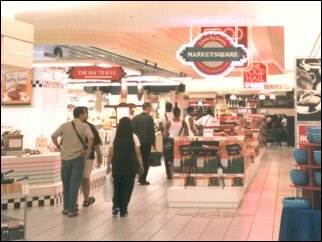 The left photo is a view towards the store, while the right photo looks towards the Toronto Eaton Centre. 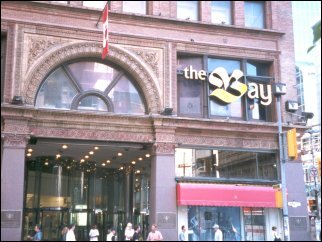 The store's Queen Street facade, as seen from the corner of Queen and Bay Streets. The base of the Simpson Tower is to the right. 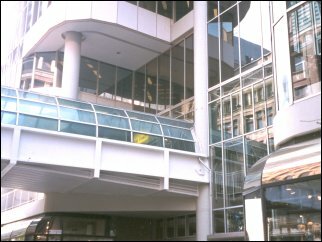 Entrance at the corner of Yonge and Queen Streets. This entrance, originally beneath the large "Simpsons" sign, was shown as the main entrance on the show. 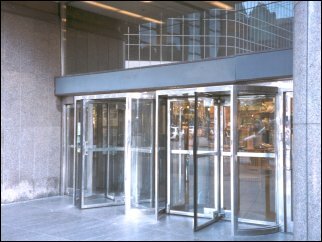 Here was where Jodie ran out the door on the way to the main office to save the store (Jodie ran through the revolving door to the left). Additionally, Sam and Jodie met the limousine at this entrance in 1985's Live on Stage, and Sam met both Phil Fanelli (Phil's Visit) and Junior (Junior) at this entrance. Text above the revolving doors used to read "Simpsons open until 9:00 Monday to Friday". 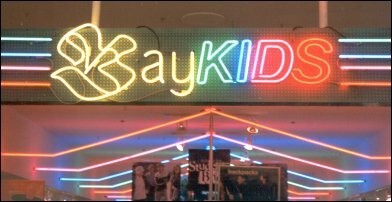 This text was presumably removed in 1991 when the store was converted to The Bay. 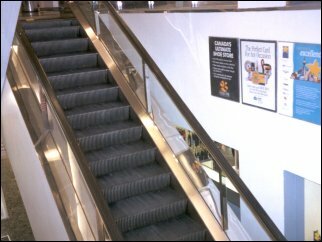 One of many escalators in the store. The escalators are located in the center of the floors. 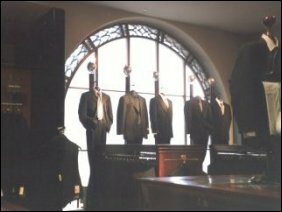 The store's third floor. The third floor houses the women's department.